Not to mention all the stress you experience while parenting a baby who’s chronically overtired! When your baby takes short naps, it always helps to have a fresh set of eyes look over your routines to pinpoint areas that have room for improvement. It’s how I love to help families during our client consultations. But today I’m going to give you some tools to examine your child’s environment and your family’s routines so you can create your own plan of action. I know how it feels to have a child with serious sleep issues. I’ve been right where you are, and I’m here to guide you now. First: Your baby takes short naps, but what does that mean? It’s anything less than a full sleep cycle. A full sleep cycle is usually around 45 minutes, although plenty of children need at least a solid hour to feel truly restored. 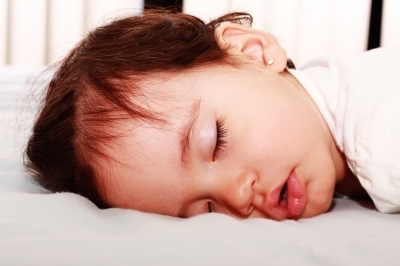 For older babies and toddlers, the sleep cycle matures to around 90 minutes. There are four stages in each sleep cycle, with stages 3 and 4 being the most restorative. It’s when the immune system and damaged cells get repaired and new tissue is generated. 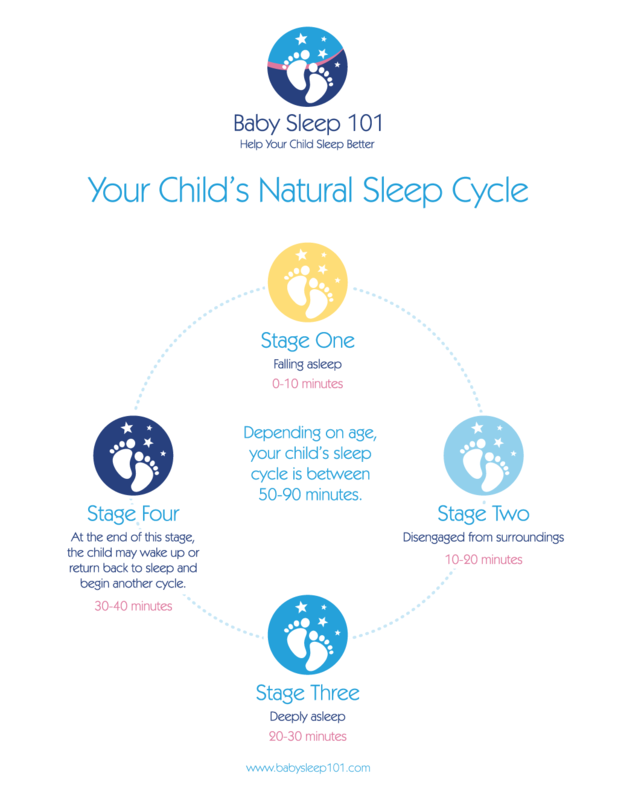 Your child falls asleep in stage one, then moves through stages two, three and four as she falls more deeply asleep before exiting out of stage four. Then she comes to a transition point and has a partial awakening. From there, she’ll either go back to sleep or wake up completely – and the nap is over! For many babies, one cycle is simply not enough to feel fully refreshed, they need to connect another cycle together. So instead of having one 30-45 minute nap, the nap may be closer to 1.5-2 hours, allowing your baby to wake up happy, healthy and fully refreshed. And research reveals that morning naps tend to help your baby’s brain mature, while afternoon naps restore the body physically. They’re both very important. And it’s important that both naps are completed fully and not shortchanged. How Do Children Act When They’re Chronically Overtired? Their bodies begin running on adrenaline, causing them become overactive and hyper. This can often look to parents like their child isn’t tired – but they’re actually exhausted! The extra cortisol and adrenaline from being kept up too long can then prevent a child from calming down enough to fall asleep. Here are four questions to get you thinking about your child’s routines and to help lengthen short naps. #1 – Are You Initiating Naps At The Best Possible Time? It can be a tough call for parents: if you try to get your baby to nap too early, he’ll resist. But if you wait too long, and he’ll get another burst of energy and you’ll have missed the window of opportunity. Move her evening bedtime to an earlier time, and stick to it. Aim for your child to be asleep for the night within 3-4 hours after he wakes from his last restorative nap (that’s a nap lasting an hour or more). While this seems counter-intuitive, if short naps are caused by overtiredness, helping a child to go to bed on time, actually assists with developing longer naps the next day. 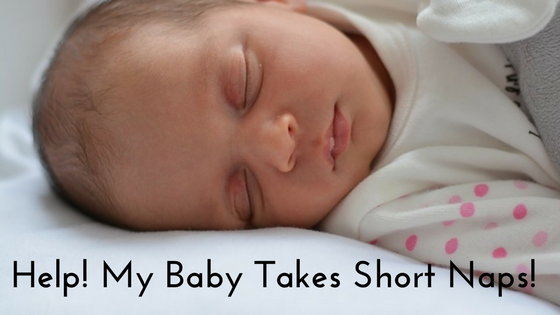 Keep your baby’s wake times very short, especially if she’s under 6 months. A newborn should only be awake for under two hours at one time, but even a 9 month old may only be able to handle 3 hours at the most. After 6 months, a morning nap routine should develop at around the same time everyday; this is typically around two hours after the morning wakeup. Most babies prefer a shorter wake time in the morning and can handle a slightly longer wake time in the afternoon. Remember: if you try to keep your baby up longer than this, she can quickly become overtired and much more difficult to get to sleep. Learn to recognize when your child is just starting to become tired. A very common mistake is waiting until your child is yawning and obviously very sleepy. But by that time, she’s no longer drowsy – she’s overtired and exhausted which triggers a short nap. Be on the lookout for low-key cues like quieting down, staring into space, losing interest in toys and people, or becoming less active. Remember to take your child’s age and overall sleep needs into account. If they’re getting less than the recommend overall sleep, this can perpetuate the short nap cycle. Newborns. Need 16-17 hours in a 24-hour period, with six hours total in naps. 1-3 months. 15-16 hours in a 24-hour period, with 4-5 hours in naps. 3-6 months. 4-15 hours in a 24-hour period, with 3-4 hours in naps. 6-9 months. 14-14.5 hours in a 24-hour period, with 3-4 hours in naps. 9-12 months. 13-14 hours in a 24-hour period, with 3 hours in naps. 12-24 months. 12-13 hours in a 24-hour period, with 2 hours in naps. 2-3 years. 11-13 hours in a 24-hour period, with 1-1.5 hours in naps. 3-4 years. 11-12 hours in a 24-hour period, with 1/2-1 hour in naps. #2 – What Are Your Child’s “Sleep Associations”? Earlier I mentioned that one sleep cycle is usually around 45 minutes. After each cycle, it’s time for your child to either enter into a new sleep cycle or wake up. But if your child is used to falling asleep while being rocked, for example, then after 45 minutes, she won’t be able to fall asleep without being rocked again! This is a “sleep association” for her, and it’s a normal part of human sleep. Even as adults, we have plenty of sleep associations; we prefer cool pillows, sleeping in a certain position, or having the blankets on or off. Problems sometimes occur with babies when their sleep associations are something that you as a parent must do for them, instead of the child being able to do it for themselves. If this sounds like you, you’ll want to learn more about sleep training methods, from gradual to direct methods. In the meantime, keep your child’s sleeping location consistent. The most restorative sleep happens when your child is still and flat, so try to avoid things like cars, swings, and vibrating chairs as much as possible after three months of age. Even if you have an older toddler whose afternoon nap only happens sometimes, it’s best to encourage him to go to his room for “quiet time”. He may not fall asleep, but it gives everyone in the house some relaxing quiet time. Also need help with your child’s night wakings? Download the Baby Sleep 101 free sleep guide: Help Your Child Sleep Through the Night: 5 Tips Every Parent Needs to Know. #3 – Is Your Baby’s Environment the Right Temperature? Too Light or Dark? Too Noisy or Quiet? The best temperature for infant sleep is between 65 and 70F. If it’s too hot in your baby’s room, the discomfort can prevent him from falling into a deep, restorative sleep. When we fall asleep, our core body temperature cools down, and a hot room works against the body’s natural processes. Too much light also negatively impacts your baby’s sleep; it can prevent melatonin from being released in the bloodstream. Even when your child is sleeping, his brain is busy soaking up outside signals. A dark room sends the message that he should continue sleeping – this is a great way to extend naptime. Hang curtains, lower the shades, and remove any nightlights from the room. Many parents also think music will lull their baby off to sleep, but music can actually prevent the brain from descending into the deep stages of sleep. 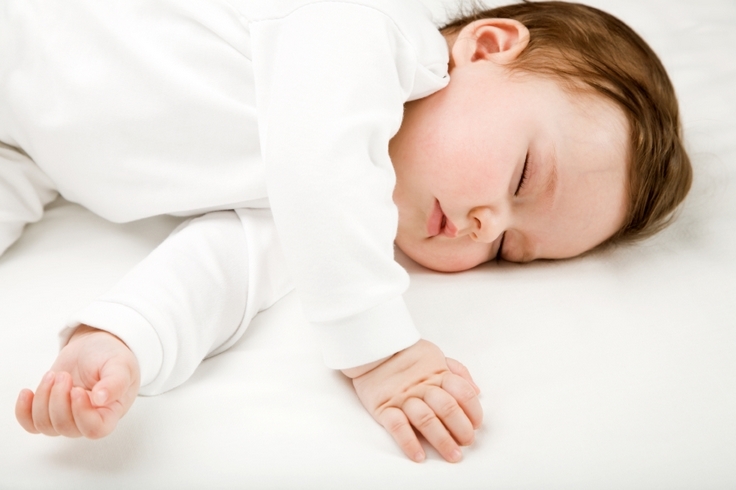 It typically takes 10 to 20 minutes for your baby to fall into a deep sleep. The fewer distractions, the better. Many babies sleep best when they’re surrounded by the white noise, but sometimes loud, sudden household noises can startle them and keep them from drifting off to sleep. If you have older children, consider using white noise apps or machines to minimize outside noises. White noise allows a baby to dive into a deeper level of consciousness, but once he’s asleep, there’s not as much need to keep everyone quiet. #4 – Do You Have A Wind-Down Routine? Renowned pediatrician Dr. William Sears calls it a setting event: when your baby recognizes changes in her environment as the prelude to naptime. This sets up patterns of association in her brain between feeling tired and taking a nap. I also like to call it a “wind down routine.” Create a naptime/bedtime routine that you and your child do every sleep period, whether it’s a nap or bedtime. If your baby takes short naps, providing a wind down allows their body to become relaxed. This reduces the chance that a short nap will result due to being over stimulated prior to a sleep period. A wind down routine should be about 5-15 minutes long, with the majority of it done in your child’s room and in low light to help serve as a cue that it’s almost time to sleep. This routine can include a diaper change or using the potty, reading books, singing a soft lullaby or even just cuddling. This vital step helps to cue your child’s body and brain that it’s time to relax and get ready to sleep. In fact, a wind down routine is so important for great sleep that it’s even recommend for adults! Parents – Don’t Get Discouraged! Remember: If your child has continually missed their sleep window for several days, weeks or months, it has a cumulative effect on their bodies and it will take time for them to recover. If your baby takes short naps, don’t get discouraged after a few unsuccessful tries at improving your situation! Getting rid of accumulated overtiredness is a process, but you can do it. And I’ll be here to help you along the way. Be sure to sign up for my monthly newsletter to get tips like these delivered straight to your inbox! Now let me know in the comments: what are your favorite tips for getting rid of those dreaded short naps? What’s worked for you, or what are you looking forward to trying?